Connecticut Governor Targets Hospital Funds To Close Budget Gap : Shots - Health News When Gov. Dannel Malloy pushed to tax hospitals in 2012, he said the money would come back to the institutions through state funding. Now he's reneging, and the hospitals are threatening a lawsuit. Connecticut Gov. 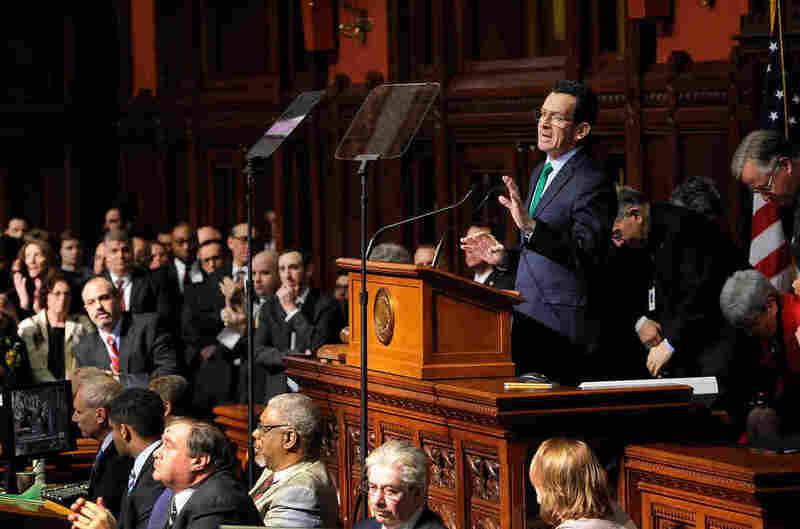 Dannel Malloy unveiled his budget to the legislature last February, but the year's expenditures were greater than income. Connecticut's leaders voted to cut hospital funding to help close the gap. This week Connecticut's leaders had to close a $350 million hole in the state's budget. One place they cut is hospital funding, and that's making hospital executives furious. The battles lines are clear. Gov. Dannel Malloy, a Democrat, says the hospitals are getting rich off taxpayers, making more money than in past years — thanks, in part, to the Affordable Care Act. So he thinks hospitals can afford to give some money back. "If you make almost a billion dollars a year, how bad are things?" Malloy asks. "If you're having the best results in recent history in hospital performance why do you need the citizens of Connecticut to give you an additional $500 million?" Malloy is making his argument personal — taking aim at the high salaries of hospital CEOs. Many of the executives of the state's nonprofit medical institutions make at least a million dollars a year, he points out. "If they're hurting so bad," Malloy says, "why are they paying their chief executives $3.5 million dollars?" "
But where the governor sees bloat, the hospitals see a politician using them as easy targets. The medical institutions are paying for political-style advertising to tell constituents that his cuts will have a serious, negative effect on patient care. "Longer wait times, fewer cancer screenings, and nurses will be let go," one ad says. "Tell Gov. Malloy to stop cutting our hospital care. Lives depend on it." The hospitals say bringing up CEO pay is an irrelevant distraction. Cut it in half and you'd barely make a dent in the state's budget problem, they say. Dr. John Murphy, who runs Western Connecticut Health Network, says there's a bigger problem — the governor is either misrepresenting hospital economics, or he doesn't understand them. "If you look at, how much money did you really make — operating income? If that's the number," Murphy says, "and it's a pure accounting number, we lost tens of millions of dollars last year." As for 2015, he says, "I'm sure it's worse." The governor's staff sees the hospital's balance sheet differently. If lower-paid hospital employees and small programs are taking a hit because of the state cuts, Malloy's office argues the blame should be on hospital boardrooms — not the state government. It's the board members who are prioritizing executive salaries over other financial needs. This public fight between the state and its medical institutions is playing out largely because of what the hospitals say is a broken promise. In 2012, the state of Connecticut implemented a new hospital tax. The hospitals would pay around $350 million a year to the state, and all of that money — if not more — was supposed to be returned to them as Medicaid payments. But that was then. Until Tuesday, the state budget was out of balance. To help fix it, Malloy wanted to cut another $63 million to hospitals; lawmakers put about half of that back. But the numbers still seem out of whack to Patrick Charmel, the CEO at Griffin Hospital, an independent nonprofit in Derby, Conn.
"So, now we're talking over half a billion dollars," Charmel says. "That's what hospitals are paying in terms of the tax. And, essentially, we're not getting any of that back." He thinks hospitals have cut all they can, despite what Malloy thinks. "When there's a cut in state payments to hospitals or federal payments to hospitals, it's got to come out of care delivery," Charmel says. "There's nobody else to shift it to." Medicaid is lurking in the background of the discussion. The state says more people than ever are getting Medicaid, and Medicaid payments to hospitals have more than doubled in 10 years. But don't tell that to Murphy. Hospitals lose about 60 cents on every dollar of Medicaid service, the hospital CEO says. "The fact that we're getting more Medicaid patients to take care of, and on every one of them we have financial challenges associated with that care — it really isn't a windfall for us," Murphy says. "In fact, it's a greater economic burden." While this year's budget may be back in balance, the hospitals are gearing up for a long-term fight. They want the tax ruled invalid — a move that could take the fight from the capitol to the courtroom.